Prep Time: 30 minutes – Cooking Time: 1 hr & 30 minutes – Total Time: 2 hrs. 5 fresh Tomatoes grated or 2 tablespoons of Tomato Paste. Continue by adding in the fresh tomatoes & tomato paste. If your using ready made tomato sauce no need to go ahead with this step. On the bottom of the baking pan add a couple of tablespoons of Tomato Sauce. Lay a few Lasagna sheets on top. then add a layer of Feta and Parmesan Cheese. Continue layering until Lasagna sheets and mix have finished. I hope you enjoy this delicious summer dish!! Wonderful lasagna! Thanks for sharing the vegetarian version. Yes, its stable, thanks Sophie. What are you whipping up today? Lol -No such luck - very hot, humid and rainy - bet your chicken salad is to die for! 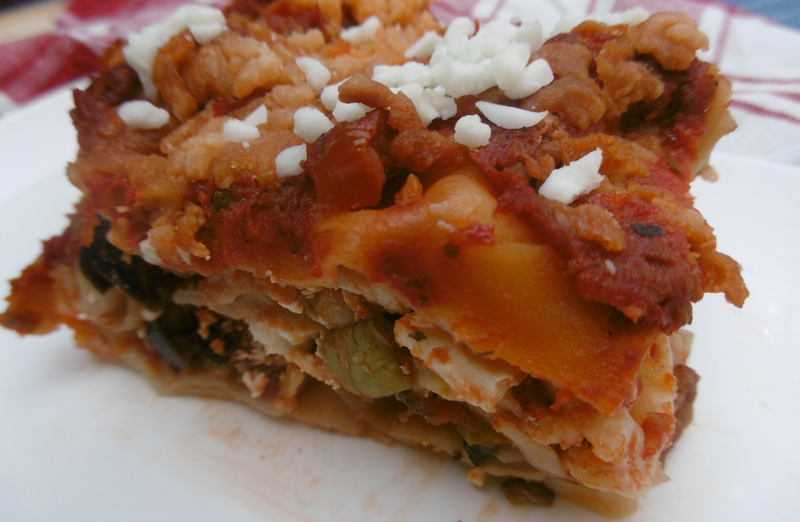 I love vegetarian lasagna! Thanks for sharing and happy Monday!